A Room with a View is a beach front 1 room studio apartment, part of McCloud House, built in 1930. The building has been extensively renovated in character. The property is on The Esplanade at Port Noarlunga. The beach,jetty and reef are just across the road. We have two studio apartments on level one adjacent to the owners residence. The original guest house dining room on the ground floor is now a restaurant. The Beach Studio provides all the facilities for your comfort and relaxation including a king size bed. It has a small retreat area, and en-suite with a large old fashioned claw foot bath and separate shower. We have a cot, fold up bed and a sofa bed so could take an extra adult or 2 children. They would be in the retreat area. We also have another studio apartment on Stayz name Heritage View. Each studio has a king size bed, en-suite, air conditioning, its own balcony, and kitchenette. Off street parking is available. There are coffee shops and restaurants nearby in Port Noarlunga village. Port Noarlunga is a heritage location in the beautiful Fleurieu Peninsula. It is located 40 minutes south of Adelaide's CBD and the airport with an excellent suburban train service. The Port Noarlunga beach, the sand dunes and the Onkaparinga River mouth was judged Australia's cleanest beach for 2010. 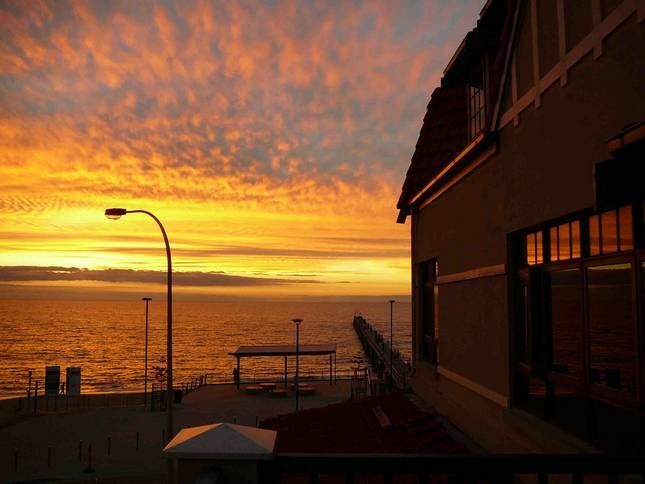 We regard the Port Noarlunga beach as one of the best and most interesting in the Fleurieu. It has a beautiful sandy beach for swimming and relaxation, a jetty for fishing, a surf beach nearby, a reef on which to snorkel or scuba dive, walks through the dunes and along the Onkaparinga estuary. Just a 15 minutes drive to the wineries and bushland of McLaren Vale. Further south the Fleurieu Peninsula, Cape Jervis, and many other site seeing opportunities.Take a drive along the spectacular coast to Victor Harbor, and take a ride on the steam train to Goolwa or the horse drawn carriage ride to Granite Island. There are many wonderful restaurants and pubs serving beautiful food using the local produce throughout this region. Local information such as pamphlets and tour operators are provided in the Studios, or feel free to ask any questions with your hosts Bob and Julie. We had a wonderful stay, Julie was very accomodating and the room was awesome and very clean & tidy with such character. I have already recommend to my friends & family and we will definately be back again. Thanks for a wonderful stay. McCloud House is situated opposite a very picturesque beach at Port Norlunga. Our accommodation was excellent with everything you could think of supplied by the owner. A gem of an apartment. Thank-you Kerry and Peter, It is always encouraging to read visitors have enjoyed their stay. We had a wonderful time here for our anniversary. Lovely accommodation and location. Great place, had all the comforts, amazing long bath, great ocean views, nice touches like home made biscuits, would definitely recommend it. Lovely place - spacious apartment with view. Upstairs apartment with great view from generous balcony. Spacious living quarters and bathroom, a mix of modern facilities plus olde-worlde charm and character. Kitchenette looked good enough to stay for a week, but we only stayed overnight.